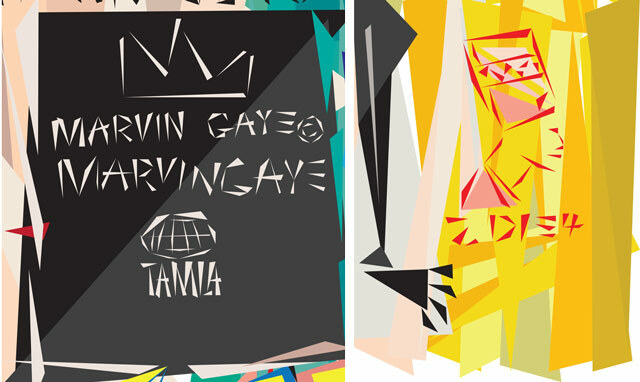 1xRun: Can you talk a little bit about this series and how you came up with this concept..
Naturel: Basically all three pieces were created to chronologically breakdown each of the artists throughout each of their careers. 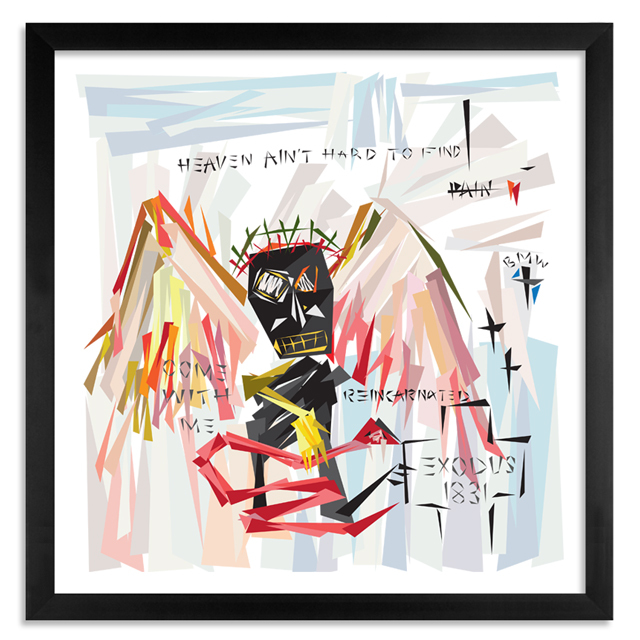 Each of the pieces in the series features a few of Tupac’s lyrics and tattoos, as well as references to both artists and some of the parallels I noticed throughout the process of creating these pieces. When I started this project a few weeks ago, I thought the whole Tupac and Basquiat idea would be a cool little mash up, but then I started to realize that these two had very similar lives and careers. 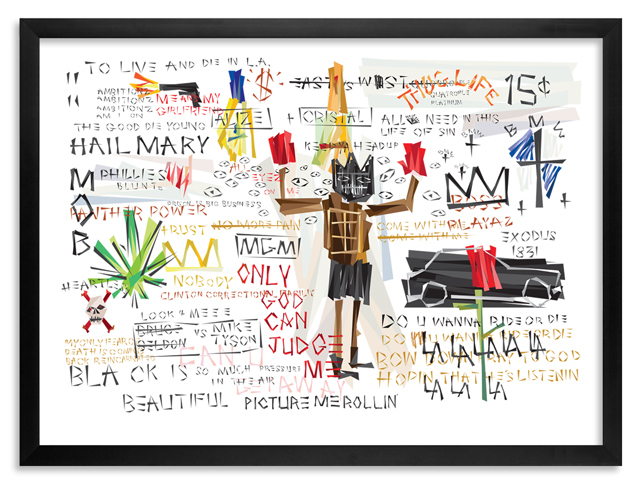 I realized that both Tupac and Basquiat were very crude in their craft. Tupac wasn’t necessarily the best lyricist, he didn’t construct the best songs, but they were straight to the point. The crudeness, honesty and the instinct within those songs struck a chord. It was the same thing with Basquiat, he wasn’t the most painterly of painters, but he was so instinctual that it embodied what it was to be an artist. Straight from the gut, straight from the heart. Not really thinking about what it was. 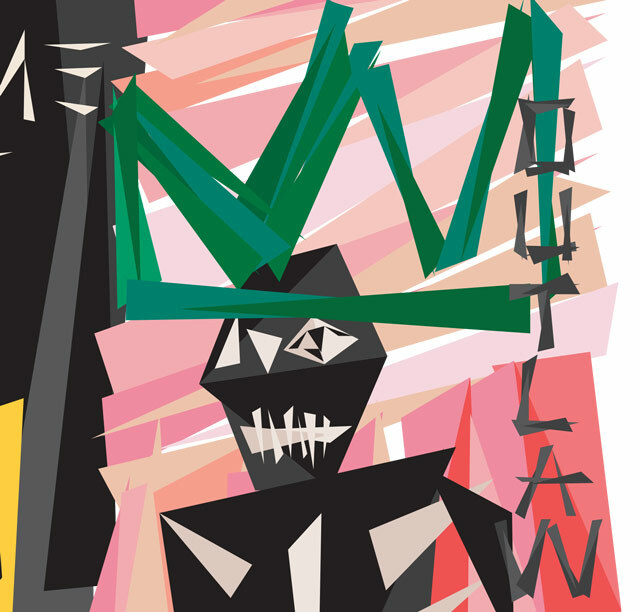 The first piece in the series chronologically “Our Lady Afeni” was made to represent Basquiat’s first pieces when he first painted on canvas. He was using lots vibrant colors that were spread out throughout the canvas. So as I was doing research on Tupac I saw that while his mom (Afeni) was pregnant with him she got locked up for her involvement with the Panther 21 party. In an interview she said that the cops busted in her place and stuck a gun to her belly. Tupac wrote a lot of songs throughout his career about a woman’s struggle, so that’s where some of the other iconography comes from. “Keep Ya Head Up” samples Roger and Zapp, so we’ve got the Zapp logo behind the gun. 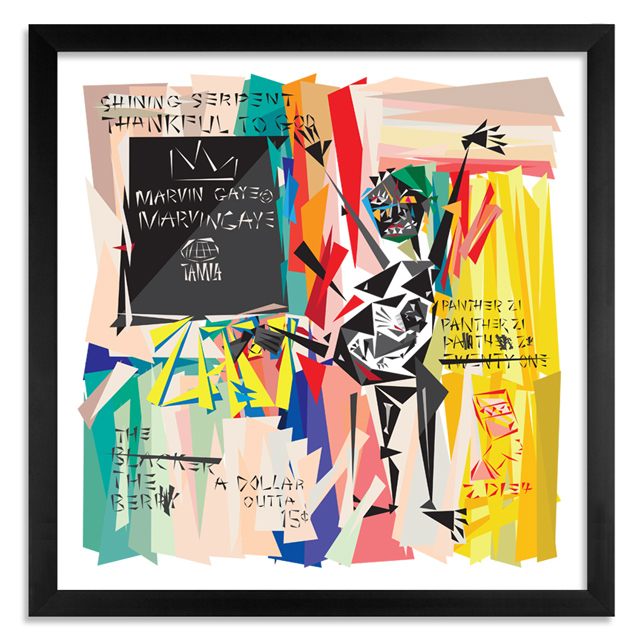 That song, and a lot of Tupac’s music references Marvin Gaye, so we’ve got that record in there, with the iconic Basquiat crown above and the Tamla Motown label below. In the bottom corner this piece has Tupac’s Queen Nefertiti tattoo with 2 Die 4 written beneath it. 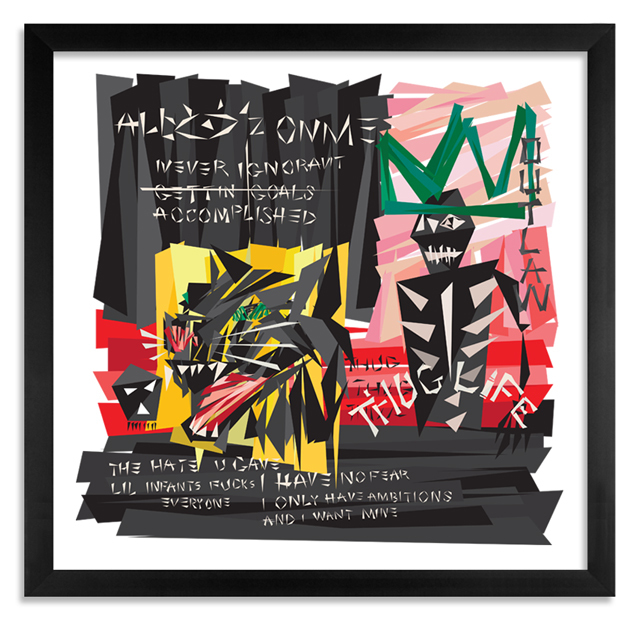 The second piece chronologically, “The Prince, The Panther” represents Tupac growing up and his impending success. While he was growing up under his mom (and the rest of the Panther party) he was often referred to as The Prince in the next generation of the panthers. In his own way he embodied the next generation of the Panther party, or at least took those views into the street. He basically ended up with his own movement called Thug Life and that stood for the hate you give an infant fucks everyone. The piece also has the panther itself in it at the center, that’s another one of Tupac’s tattoos that he has on his arm, as well as another the Thug Life across his stomach. 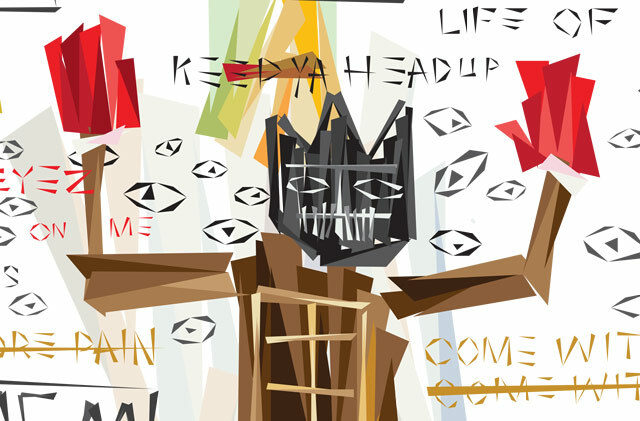 There is also Basquiat’s iconic crown again this time on Tupac. The last chronologically of this triptych is “Dying To Live.” Tupac had jeweler make an angel of death medallion, and the first time that he wore it was the night of his death. So this piece represents the birth of a legend. Dying as a man and being reborn as a legend. A lot of his songs predict his death. It was the same thing with Basquiat. After Warhol passed he would get really morbid and would start writing these short phrases like “man dies” with a peace sign over and over again. Pac died in a BMW and I kinda saw that sign and the way that the logo was it presented a cross right where he passed away. There are also 2 more tattoos in this one, on his back Pac has Exodus, or exit, and 1831 which was for Nat Turner. The larger piece, “Tupacsquait” is a visual rendition of what you feel when you hear Pac’s music. It has more song titles, various quotes and a few lyrics in there. 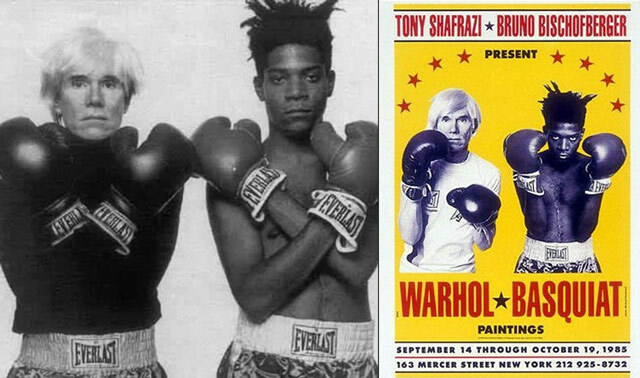 Basquiat had a few paintings with boxers, and he would create these boxer flyers where he would often refer back to old infamous black boxers. It was the same thing with Tupac, he was close with a lot of boxers and fighters. the night that he was shot he was at the MGM wanting Mike Tyson fight, that’s the figure in the middle there. There’s a few lyrical references, the car with the rose in front of it, that’s the car that he was in, which kind of goes back to Hail Mail with “do you wanna ride or die?” There’s a reference to Thug Passion with Alize + Cristal. There’s a bunch of different tattoos in there, “Only God Can Judge Me” and “My only fear of death is coming back reincarnated”. 1xRun: How long have you been working on this project? Naturel: I started this project about 2-3 weeks ago. To get the process down, I dropped a lot of my methods in approaching art and adapted Basquiat’s approach. During his process he would play movies, he would read books and he would listen to music all at the same time, then he would work on a bunch of different pieces at the same time. So that’s what I did. I started all of these pieces at the same time and while I was watching their documentaries, I would flip through their books and listen to Pac’s music and things would just pop out and that’s how they ended up on the pieces. I learned a lot through how Basquiat was meticulous in what he includes, it’s sort of like a visual highlighter for what popped out at him. It’s not as random as people think, there’s a harmony and a rhythm to putting things into your piece and working within the composition. 1xRun: What is unique about these pieces compared with your other work? Naturel: For this study I really just abandoned most of my approach and I allowed all the research and just the nature of the two artists to kind of take the wheel. 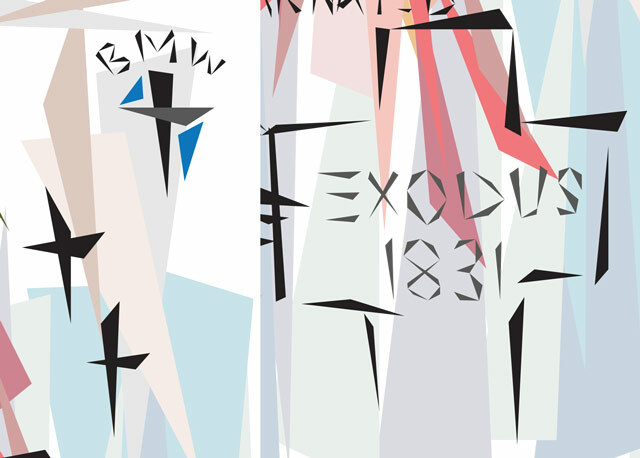 The only thing that remains of my process is the use of the triangles and it being vector art. For the most part everything is immersed in both of their worlds. I adapted as many of their techniques, mostly from Basquiat of mixing things in and jotting things down. 1xRun: When were you introduced to each of these artists and what’s your relationship with each artist been like throughout your life? Naturel: I got put onto Pac really early in my childhood, maybe around 4th or 5th grade. I remember when “Brenda’s Got A Baby” and “Keep Ya Head Up” would pop up on the radio. I grew up on the East coast so it wasn’t a Pac type environment. So I knew the hits first, but I didn’t get more into it until high school and that’s when I started falling in love with a lot of the earlier stuff. I had this whole surge of people around me in Washington D.C that were really about his music and his movement. Early on a respected him for the art, and I enjoyed his music. I didn’t fully understand his life and his craft until I really immersed myself in all of it. The same thing goes for Basquiat. I was introduced to Basquiat through art history classes at college. On the surface he’s one of those artists that it’s kind of hard to grasp a hold of. His work is real cerebral, it takes a lot of understanding of his whole entire story and his whole entire life to appreciate what he does.This exercise really made me feel his craft. As artists most of the time we get real heady and in our own thoughts. Get all cerebral and too esoteric. It’s not as instinctual as just putting something on the canvas, or putting something in your piece because it’s there. Not really thinking about how it develops, just letting it happen. For last few weeks I’ve just adapted that to these pieces, and it really shows a lot about myself. How much time I waste, how many good moves, good thoughts and good instincts that I shove aside because I think it has to look a certain way. To me Basquiat represents freedom. This stuff is super free. No inhibitions, no reservations. The idea that this is what it is. This is how I feel. This is how it’s going to come out and I really respect that as an artist. At one point in my career I’d love to be that way. The importance of this project and of these pieces is to highlight the fact that too often in our culture there are these great craftsmen and artists that pass away that do not get the shine, the recognition that they should have got when they were living. Too often when an artist is alive the general consensus is that they are taken for granted or creep below the radar. I think with my own art that I hope it will be as important as these two artists were to me and artists like me.